Yesterday we went for Cherry Picking. From there we brought fresh cherries. I wanted to bake a cherry cake from so many days. Now I had a chance of baking it.This cherry cake is very simple to make and it is extremely delicious. 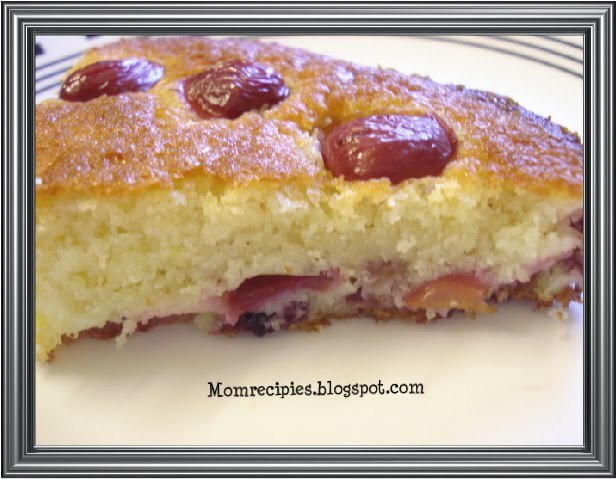 It is a very moist cake with a balance of sweetness and a little bit of sourness.Fresh Bing cherries are used to make this cake.It would keep well for 3-4 days . 1) Preheat oven to 375 degrees F (205 degrees C). Butter and flour an 9 inch (23 cm) baking pan and line the bottom of the pan with parchment paper. Keep aside. 2) Rinse, dry well , and pit all the cherries. Take about 15 cherries to be placed on the top of the cake during baking and cut them in half. Cut the remainder of the pitted cherries into quarters. 3) In a large bowl whisk together the all purpose flour, baking powder, and salt. Keep aside. 4) In the separate bowl beat the eggs and sugar with electric mixer / hand mixer until thick for about 3-5 minutes. Add the melted butter, milk, vanilla and beat just until combined. 5) Mix the dry and wet ingredients together and stir just until moistened. 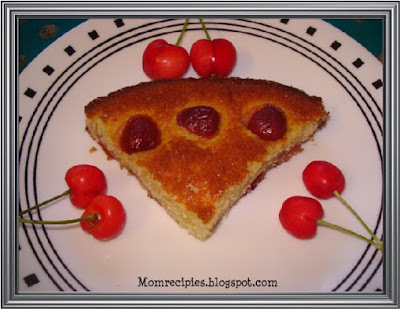 6) Gently fold in the cherry pieces (but not the 15 cherries that you have halved for the top of the cake). Pour the batter into the prepared pan. 7) Bake for 15 minutes then remove from oven. 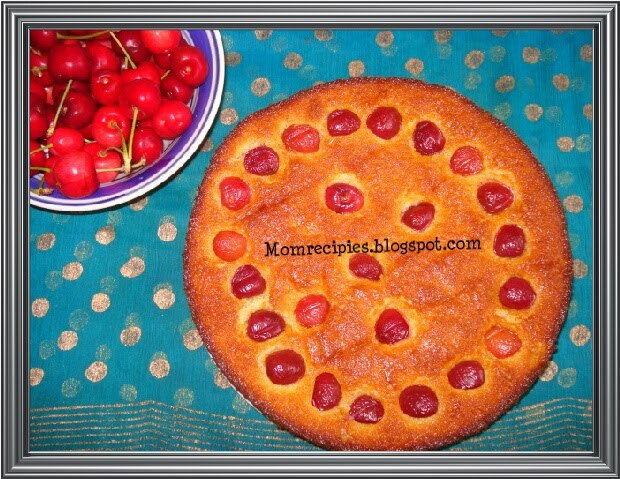 Sprinkle with the remaining cherries, cut side down, on the top of the cake. 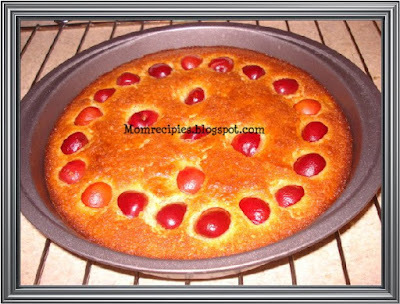 Return the cake to the oven and bake for a further 25 minutes or until golden brown and a toothpick inserted into the cake portion comes out clean. 8) Remove from oven and place on a wire rack to cool for 5 minutes After about 5 minutes invert the cakes onto the wire rack, If needed, run a sharp knife around the edges and remove side of pan .Remove the parchment paper, and then cool completely before cutting. Otherwise, it will be a crumbling. 9) Serve warm or at room temperature with a dollop of softly whipped cream. Source:Wells, Patricia. 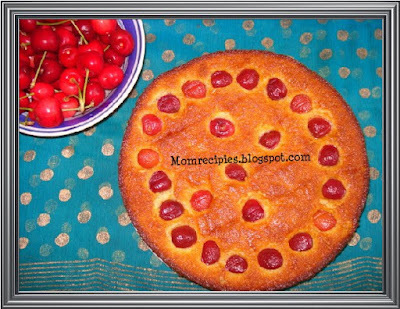 The Provence Cookbook.